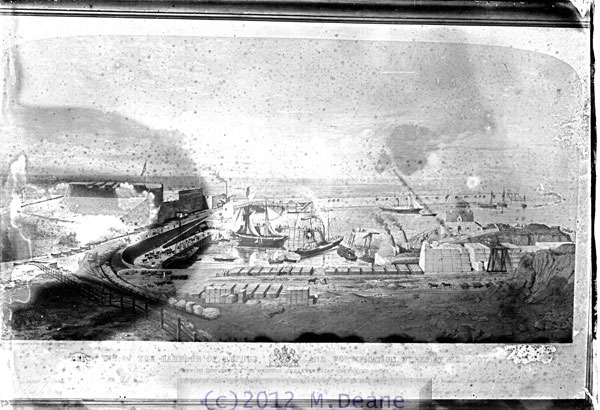 This image which was issued as a postcard comes from a very badly contaminated negative showing Alderney's Breakwater construction in the Autumn of 1852. SHEWING 1300 FEET OF THE WESTERN BREAKWATER AS COMPLETED IN THE AUTUMN OF 1852. THE LENGTH OF THE BREAKWATER WILL BE 3500 FEET." There is further writing in script which is very hard to read and needs further study, but the name "James Walker Esq" can be easily discerned - he was the person who designed the Breakwater and if his name is fed into a web search engine much information will be gained about him.